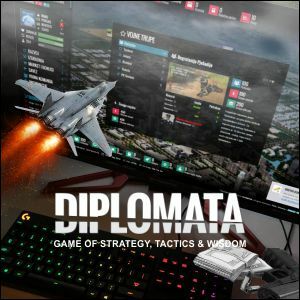 Diplomata The Game is a free turn-based game that combines strategy and social skills. Your main aim is to build facilities, increase your territory and defend your area from other players. Residential buildings are meant for the population and factories produce the raw material which is necessary for troops. The status bar gives you information about your earnings and production. Join an alliance to get advantages and more protection. Earn gold to be able to buy special bonuses. You may take the special turns to earn more money, improve your health and increase the production.